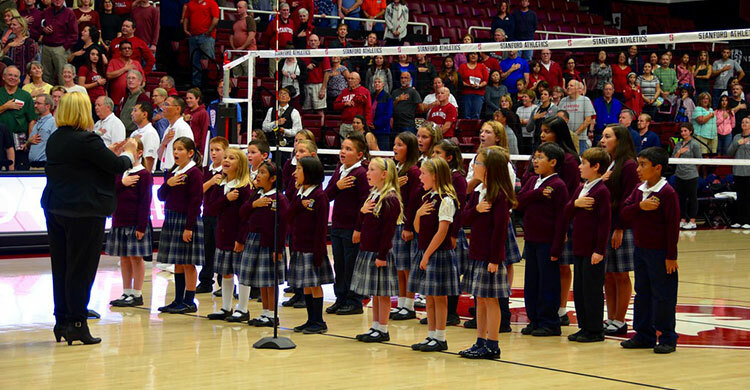 Friday night October 30, Canyon Heights Academy was well-represented at the Stanford University Women’s Volleyball game against opponent Arizona. Over 200 students, parents, faculty and staff, dressed in uniform and CHA spirit wear attended the game. The Cardinal Choir, under the direction of Ms. Judaline Swinkels, sang the National Anthem a cappella. It was impressive! After the National Anthem, the CHA Cardinal volleyball teams lined up to make the fan tunnel when the Stanford starter players were introduced. It was a great experience to see the players up-close and cheer them on. Fantastic volleyball followed, and our teams saw first-class playing. In best of 5, Stanford defeated the Arizona Wildcats in 4 games.